I had leftover circles from a sketch which never worked out and I turned them into fun tags. 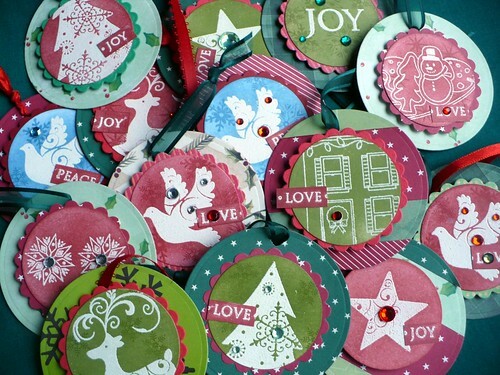 The circles bases are lefovers from Christmas window cards. Together with Starbucks matrioshka coffee cups they were packed in my husband's suitcase just in time for him to leave on his business trip to California. The inner circles are poped up for dimention. I thought it first it was my idea, but remembered that I saw this frugal use of paper scraps at Betsy Veldman's blog. Рождественские ярлычки для близких друзей. Я успела закончить наборы открыток, ярлычков в подарок друзьям, и вместе с чашками-матрёшками из Старбакса они уехали в Калифорнию. Все штампы - Hero Arts. Приятно, что сегодня дизайнер компании отметил эту фотографию в твиттере. Основа для мини открыток - остатки от открыток с окошками, таким образом все пошло в дело. Мне показалось, что это я сама придумала, а потом вспомнила, что подобное рачительное использование остатков видела в блоге у дизайнера Betsy Veldman. I enter these mini cards into Hero Arts December challenge. Hi Maria, I think these tags are just stunning! Love them very much. The link to Betsy's blog does not work by the way. Thank you, Jacqueline, for letting me know. I did not notice this. The link in Russian did not work either. I have corrected it. She has so many other good tutorials.